TrailsNH.com is a pet project of mine that stems from my love of hiking, database, and web based technologies. The site is driven by bots I created to gather hiking trip reports and related information from all over the internet. The system GeoTags the location of each report, then indexes and organizes the information so hikers can find it, fast. I’ve never seen another site like it anywhere. Over the last few years I put in a lot of time working on TrailsNH, up to 20% of my week. You’ve heard about “20% Projects” at Google, or IBM? Projects like this is where innovation some from. Also, for me there is no better way to learn new technology than working on something I enjoy so much. I’ve learned or advanced many of my programming skills here: PHP, MySQL, Google Maps API, CSS3, HTML5, AJAX, JSON, jQuery, jQuery Mobile, Affiliate Ads, and on and on. Recently I tackled the issues around “Mobilegeddon“. I’m super happy with TrailsNH. It went live in 2008 and today gets lots of visitors on a daily basis. Traffic continues to grow year over year. 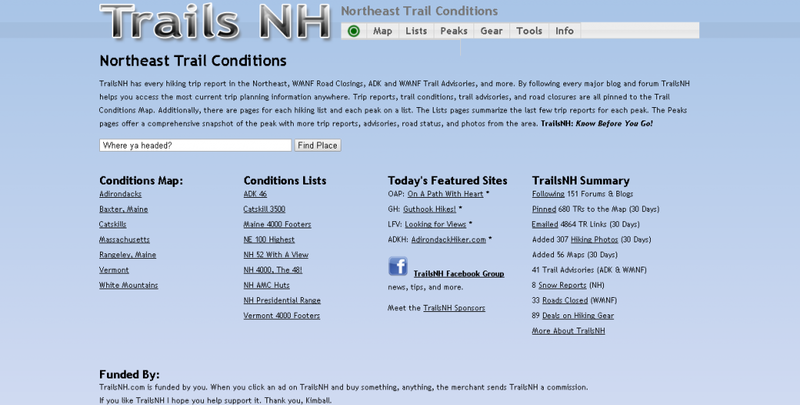 If TrailsNH is useful to you, please take a minute and leave a comment below. I’d love to hear from you.